Oh, I'm certainly not offended! I was more concerned I'd misled you. It's just that our TV choice for genre stuff in the UK is limited and only seems to be picking up this last couple of years with the resurgence of Doctor Who and now Primeval. So I loved LoM so much and saw it as a world-beater in quality compared to many US shows that are taken for granted that I like to bore people with it and try and strong arm them into watching it! 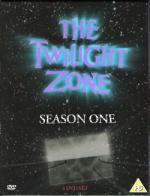 The Twilight Zone's timeless episodes featured stories of the bizarre and unexplained, blended with humour and often with an unexpected twist to the tale. Created by the legendary Rod Serling, its eclectic mix of fantasy and sci-fi has helped to define it as one of televisions most original and celebrated series. This was my first chance to watch this classic TV series. You can see, that a lot of these episodes were influences on later sci-fi stories. I had fun watching this series and I will probably continue buying the other seasons. Overall I enjoyed this first volume of the series. Even if it is rather ridiculous that no matter in which time they land, everybody speaks perfect English. 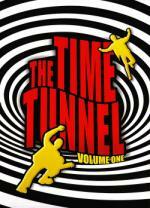 The control room of the Time Tunnel project has aged rather well for a 40 year old sci-fi television show. I liked the inclusion of the original cut of the pilot episode. At the end of this one you see, that they travelled to the next time period with the clothes they were wearing at the end of the episode (with the state the clothes were in). Sadly they have chosen, that for the series the clothes revert back to the clothes they were wearing on their first time jump shortly before the time jump sets in. This movie was predictable but fun. Tina Fey was great as usual. I had to laugh out loud a few times during the movie, which does not happen a lot. Struggling musician Peter Bretter (Jason Segel, Knocked Up, How I Met Your Mother) has spent five long and wonderful years idolising his celebrity girlfriend, television star Sarah Marshall (Kristen Bell, Veronica Mars, Heroes). 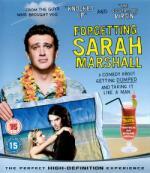 His perfect world comes crashing down when Sarah suddenly dumps him for 'that guy' (Russell Brand) from that band'. But his plan to leave his troubles behind backfires when he arrives to find his worst nightmare has only just begun! Now I remember what other reason I had wishlisting this Blu-ray besides starring (and written by) Jason Segel, who I knew from "Freaks and Geeks". It was lovely Mila Kunis. It was also great to see other familiar faces like Jack McBrayer from "30 Rock" and Paul Rudd. After the disappointing "Superbad" now a Judd Apatow produced movie again which I really enjoyed. With fuel prices skyrocketing, the Planet Express crew sets off on a dangerous mission: to infiltrate the world's only dark-matter mine, source of all spaceship fuel. But deep beneath the surface lies a far stranger place...a medieval land of dragons and sorcery and intoxicated knights who look suspiciously like Bender. 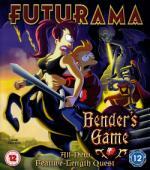 So park your hover-car and saddle up your unicorn for FUTURAMA grandest adventure yet: BENDER'S GAME! A rather disappointing Futurama movie. I enjoyed the first half hour or so, but when it began with the overlong Dungeon and Dragon parody, my was loosing my interest. The image quality on the Blu-ray is great though! This is Futurama the best that it ever looked. On the mystical island of Themyscira, a proud, strong warrior race of Amazon women lives in a utopian civilization shielded from the corrupt world of man. But a betrayal within the Amazon sisterhood leads to the escape of Ares, the God of War, and Amazon Princess Diana must capture him before he unleashes global chaos and destruction. With the aid of cocky fighter pilot Steve Trevor, Diana tracks Ares to the United States for a battle unlike any humankind has ever faced in this epic tale of the princess who becomes the World's Greatest Super Heroine. A fun movie. The only real contact I have with Wonder Woman is the 70s series with Lynda Carter. I have been waiting for a modern movie version for awhile. The live-action version seems to stuck in development hell. A animated movie is the next best thing. We have here the origin story of Wonder Woman. The beginning is quite similar to the pilot of the old series. The main difference here is, that they didn't wipe Steve Trevor's memory when returning him to the outside world. So he is very much aware of who Wonder Woman is and where she comes from. And this movie is much more violent than the TV series ever was. The character of Artemis reminded me very much of Teela from the rebooted "He-Man and the Masters of the Universe". My complaint about this movie is the short runtime of 73 minutes. They did tell the story they wanted to. But Wonder Woman's alter ego Diana Prince only appears in the last minute. I would have liked her to have a longer part. The dual life as everyday people of superheroes is what I like best about the genre. Not the big fights with powerful enemies. So all in all this movie serves well as a introduction, but it would have been nice to have more of Diana Prince in it. 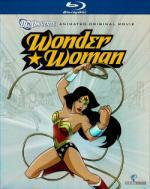 The Blu-ray also contains two selected Justice League and two Justice League Unlimited episodes which have Wonder Woman in the center of the story. Oscar®-winner Nicole Kidman (Best Actress in a leading role, The Hours, 2002) and wickedly funny Will Ferrell star as actors playing Darrin and Samantha on a remake of the television show "Bewitched" in this cleverly crafty comedy from director Nora Ephron (Sleepless in Seattle, You've Got Mail). After watching "Practical Magic" today, I had the urge to watch another movie with Nicole Kidman as a witch in it. Despite that this movie is generally panned, I quite enjoy it. I thought it was a good idea to make it about a witch who is cast in a TV show remake of "Bewitched", instead of a straight remake. Many fans of the original show didn't like this, but I never really was a fan of the show. I preferred "I Dream of Jeannie" (when is the remake coming for this one? It has been awhile that I heard rumors about it). The weak point in this movie is the missing chemistry between the two main characters. It is not really believable, that Isabel would fall for Will Ferrell's Jack. I really want to get this one as well... It is on the wish list I gave to Brittany for Father's Day. Got a question for you on this one though. In Justice League: A New Frontier and the Justice League Unlimited episodes on that disc Wonder Woman could fly (like Superman)... which I hated. Is she able to fly in this movie? In Justice League: A New Frontier and the Justice League Unlimited episodes on that disc Wonder Woman could fly (like Superman)... which I hated. Is she able to fly in this movie? Thankfully she cannot fly in this movie. This also bothered me in the episodes of Justice League, which were on this disc. I think if you want to see an updated version of Lynda Carter's Wonder Woman, then you won't go wrong watching this movie. She can fly in the comics, can't she? I don't know the comics, but according to Wikipedia, the post-Crisis Wonder Woman can fly. Also the pre-Crisis Wonder Woman could fly beginning with 1966. But I prefer the original version, where she couldn't fly. Looking at the episodes of Justice League, it is like watching just another Supergirl variation. I feel the same way. I also did not read the Wonder Woman comics. I only ever seen the Lynda Carter Wonder Woman and some cartoons... where she had the invisible jet. The invisible jet always bothered me in the Lynda Carter Wonder Woman, because it looked so fake. Although in this movie, she also had the invisible jet, but as it didn't look cheap there, it didn't bother me.